Blistering Barnacles! I am a huge Tintin fan, having read most of the books and was so excited to have just had loads of hands-on with The Adventures of Tintin, released for mobile plaforms like the iPad, iPhone and Android. I personally played the iPad version and as a showcase for iPad games, it certainly shone. 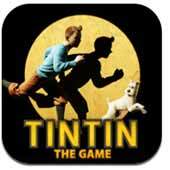 Based on the recently released Tintin movie, the game follows closely the film's locales and events. Both are based on a loose amalgamation of three Tintin books (The Secret of the Unicorn, The Crab with the Golden Claws, and Red Rackham’s Treasure). For those unfamiliar with the books, Tintin buys a model ship from a market and discovers a secret kept within it and it is this secret that entwines Tintin, Captain Haddock and trusty canine Snowy into an adventure spanning distant lands and times. 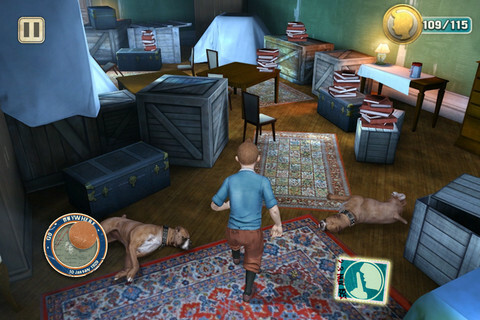 The game is controlled from an over the shoulder perspective, with the player taking control of Tintin (and others) using the ubiquitous virtual thumbstick in the bottom left. There’s the nominal screen touching and sliding to interact with the environment, like when you need to move planks out of the way or climb a ladder. 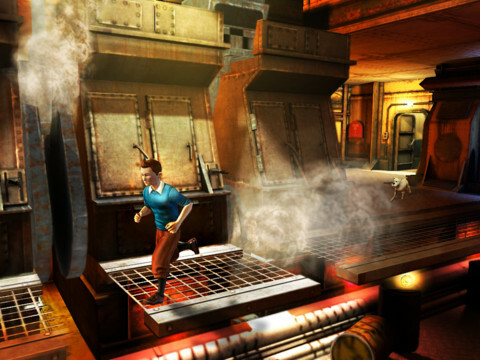 In more drastic times, for example when Tintin is being tackled, quicktime events appear and you are given a short amount of time for pressing or sliding. Also scattered throughout the game are some casual stealth scenes and cutting-the-rope puzzles, keeping the gameplay pretty fresh and varied. Each episode is very satisfying to complete. Difficulty wise, this is one easy game, and it’ll take around 3-5 hours to finish. The graphics match the movie well, with detailed backdrops and character models - there is no mistaking that this is one beautiful game. Unfortunately, the voices could do with some tweaking. Tintin sounds like a North American doing a bad impression of an Englishman though there are some smatterings of some excellent voice acting. The music and ambient sound, though, are well implemented with a suitable varied soundtrack that is a fine accompaniment to the mood of the different episodes. One unfortunate issue that I found with the game was that although it follows the movie closely, due to time restraints, I assume, some of the story has been rewritten. Key sequences from the movie have been cut, which would be fine, if further along in the game, there were no references to these missing events. I had no issues following the plot as I have seen the movie, but people who have not seen the movie will be left scratching their head at these holes. For example how can Tintin know about a scrap of paper that he has never found or read. The conclusion of the game also seems to have been hurriedly brought forward, missing some vital sequences in the movie. All in all, this was an enjoyable romp and follows the movie pretty closely. It does show the capabilities of the iPad well and is an impressive game to play and show your friends. The game is pretty short and very easy, so will suit younger players, as well as fans of the film or books. Impressive effort by Gameloft.